Some cold fronts made an appearance this week, requiring the heating system to be turned on, and socks to be worn to bed. Yes, I wear socks and gloves inside my house most of the winter, because no matter how well heated the house is, there’s usually a big difference in temperature with the rest of my body, which is beyond my control, very John Malkovich in Dangerous Liaisons, btw a fantastic movie, in my opinion, about human character. Anyway, today we’re cooking long and slow with the Sunday Supper group, hosted by Susan of The Girl in the Little Red Kitchen, and though my first thought was of pulled pork, I had a feeling the dessert part of this theme would be hard to achieve, thus leaving the whole area a bit deserted. Get it? Good thing I remembered about this 8 hour cheesecake I have bookmarked since I bought the book, which was in 1999, the time when I discovered amazon shipped to argentina. I spent a few years buying whatever cookbook I could. No, seriously, I bought some 120+ cookbooks in two years. The dollar exchange was very good to us at the time, so it was like entering their site and finding out all cookbooks are 3 bucks. How many would you buy? Back to our culinary concern here. You can say I’m a cheesecake baking addict and you would be right. You could say I’m a long and slow cooking addict and you would be on the right track. So this was the recipe for today. Perfect in every way, not least the fact that I could try another version of a traditional cheesecake. There are quite a few in this blog already, starting with the oreo cheesecake and ending with the brown sugar cheesecake, I’ve made one with caramelized apples, an italian ricotta tangerine, with a layer of raspberries and chocolate crust and the fun nutella polka dot cheesecake. Yet this one is different. The flavor is as good as any of my other favorites. It doesn’t have any starch, which is a big plus in my book and no out of the ordinary ingredients. blowing, like you can’t imagine. Unctuous and creamy, a cross between silky panna cotta and the most expensive face cream you can buy. 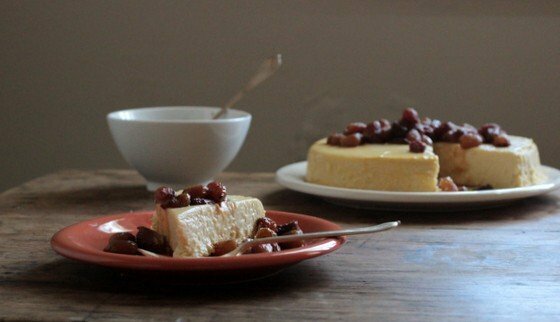 No matter how many cheesecakes you made or how many recipes you have, you should make this one. 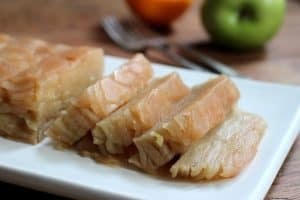 Try it at room temperature and then after 1 or 2 days in the fridge. The texture will still be ridiculously creamy. But if it’s cold it’s easier to serve. Top it with whatever you want, or leave it plain, but do make it. some almond extract in addition to the vanilla. This cheesecake doesn’t rise or crack, it bakes like a custard. Preheat the oven to 200ºF / 95ºC. Butter or spray a 8 inch round cake pan with 2 or 3 inch sides, and a non-stick surface. Or butter the pan and line the bottom with wax paper. The cake won’t rise at all, but the batter will fill just below the 2 inch mark. Put the cake pan in a larger baking tray that will hold 1-inch of water. In a large bowl beat cream cheese with an electric mixer for 1 or 2 minutes, until very smooth. There should be no lumps at all. Gradually add the sugar, vanilla, rum and cognac and continue beating until perfectly smooth. Pour the mixture into the prepared pan. Put the baking tray in the oven and, slowly, add very hot tap water up to 1-inch. Bake for 8 hours. My oven has a 3 hour timer, so I had to check twice and set it again. Halfway through the baking the batter will start to appear a bit firmer, just barely. After the 8 hours of baking, turn the oven off and carefully transfer the cake pan to a wire rack. It will still be jiggly, like a flan. Let the cake stand there, untouched, until it cools completely. Unmold onto the serving plate carefully, it is very soft. Remember that you won’t be able to move the cheesecake after you unmold it, so it will stay where it lands. 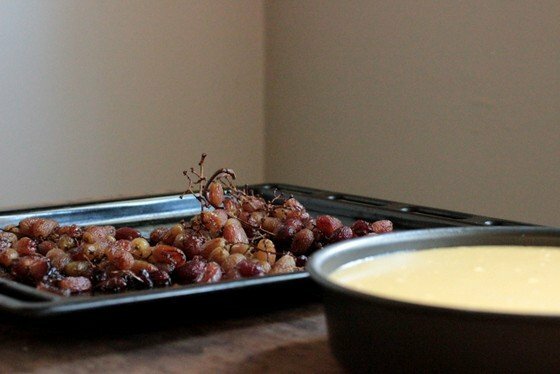 Cover with the roasted grapes and serve. Or refrigerate for 4 hours or up to 3 days and serve. The texture will be firmer but still incredibly creamy. You can also freeze it, let it thaw in the fridge. 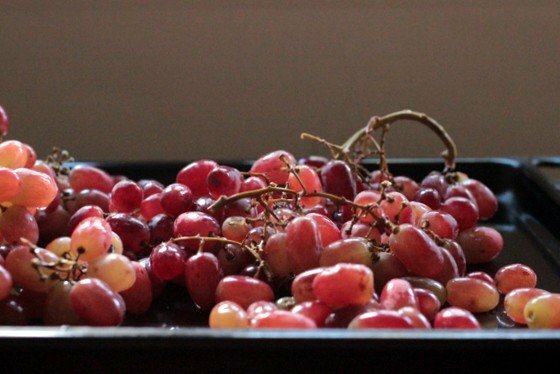 Arrange grapes in a baking tray and roast for about an hour, until they are shriveled and sticky. 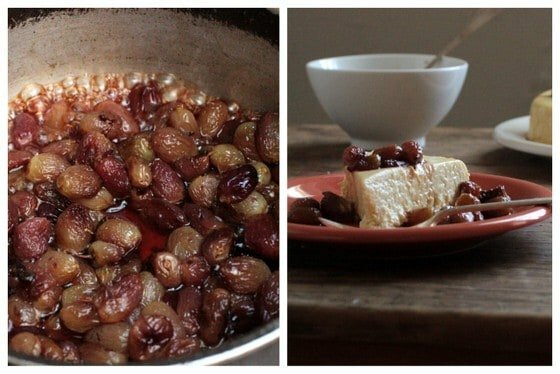 Put the roasted grapes in a saucepan with the wine, and cook over medium heat for 5 minutes, until syrupy. Take as long and as slow as you need, but check out every recipe, they’re stunning! I like all kinds of cheesecake I need to try this soon. Love that you added grapes! You have no idea how much I've been waiting for this recipe. After reading how you describe the texture it is something I know I must make. You have persuaded me! This just looks amazing. Love the roasted grapes! oh my goodness – I can't wait to make one of these! I just made roasted grapes last week and loved them. Together? I couldn't even imagine! 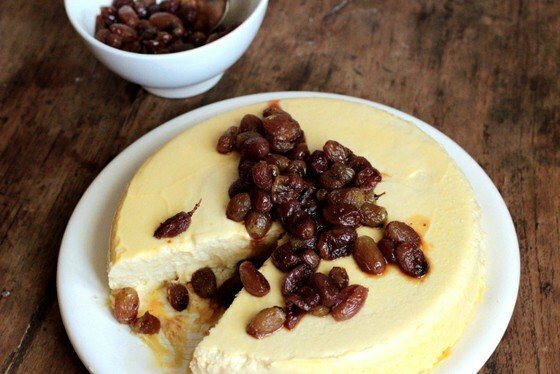 I do love a good cheesecake and this one, with the roasted grapes, sound divine. BTW, how do you stay so skinny? They´re like candy. It´s hard to imagine they don´t have added sugar. Wow, I can't imagine how creamy and amazing this cheesecake must taste after being slow cooked for 8 hours! (plus the patience one must have to wait that long). I'm also loving the addition of the roasted grapes on top. Paula – this looks magical! I actually have that book, but haven't looked at it in some time, so I don't even remember this recipe. I am bookmarking it now, because – WOWZA! And yeah, I would buy far too many books at that rate. Far. Too. Many. Cheesecake is my weakness. I'm not sure I could wait 8 hours!!! Your recipe looks marvelous…and the way your describe the consistency! Wow! Great consistency, Cognac and Rum, and grapes too…I must try! Never thought of slow cooking a cheesecake! Love this idea and I love the cheesecake!! Se ve delicioso, Paula. Tan ligero y natural. Coincido con aquel comentario que dice no creer poder esperar las 8 horas! 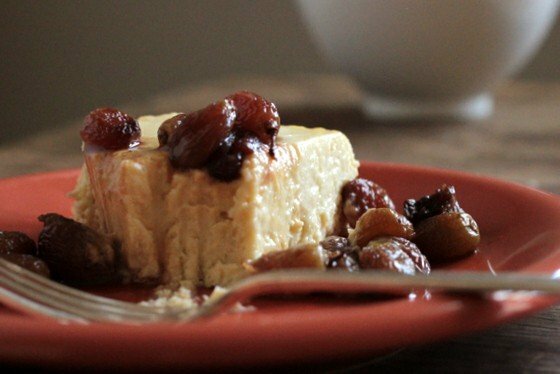 I love the idea of slow cooking cheesecake. I've had recipes to try, but I've always been hesitant – this is just brilliant and makes me want to do it. Your cheesecake looks divine! I have never tried roasted grapes but this sounds heavenly. I imagine they take on a raisin like taste which sounds wonderful with the cheesecake. I am too a cheesecake fan! The roasted grapes are such a nice touch. I am a huge fan of panna cotta and cheesecakes both, since they are usually not really sweet desserts. This sounds like a wonderful cross between the two. I am pinning this on my Recipes to Try board for when we have cool weather again and I can leave the oven on for eight hours. I may just have to make the roasted grapes now for serving over ice cream though. What a wonderful idea! Cookbooks for $5?! I would have purchased the same amount! Love getting deals! Re: this recipe, I am so glad you did a dessert too! If I would have joined this sunday, I was also thinking pulled pork but then I thought everyone would be doing that.. what a great, original idea and recipe! Dude, I didn't realize you had so many cheesecake recipes. . going to check out the fun nutella polka dot cheesecake now! And I LOVE roasted grapes!!! YUM. Oh so good! I bet this cheesecake is fabulous! Bravo. . looks delicious! I eat them on crostinis with cheese and the roasted grapes on top. . oh my gawd. so good! 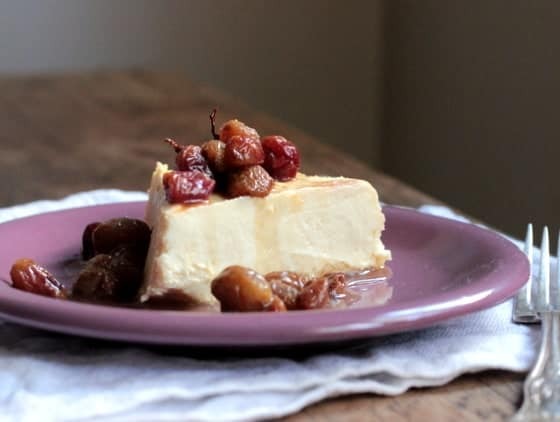 I've never heard of cookking a cheesecake for that long but it sounds wonderful and I absolutely adore roasted grapes! This looks pretty amazing and so delicious! I love it. I would give it a try for sure. Maybe do a small one, or even in custard molds to eat directly with a spoon. Just in case it doesn´t firm up as regular cheese.